Do you ever feel like blogging on your own site is like speaking to a wall? Have you been blogging for months, or maybe even years, but still not ranking on Google for your target search terms? Do you ever feel like you’re stuck in a vicious cycle of publishing epic blog posts, promoting them everywhere you can and still not driving very much traffic? See, I used to be just like you. I was blogging regularly, but I wasn’t seeing the results I wanted. I’d write what I thought were incredible posts and spend hours promoting them, but then I’d barely get any traffic from them. My blog archive got bigger and bigger, but my traffic, email subscribers, and sales barely grew. At times, I felt like when I was blogging, the only person reading my posts was my mom. It was exhausting and frustrating. I’ve figured out how to use guest blogging to get a massive amount of traffic, email subscribers, and sales. Since, I’ve been published on huge sites such as Business Insider, Entrepreneur, Huffington Post, and more. No fluff and no sleazy marketing. Everything’s FREE and in this ebook. Get FREE access the book today! Thanks! Now check your email for your free download. 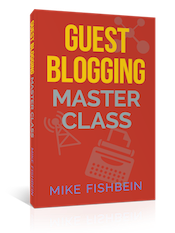 I'm working on an entire book that provides even more detail on how to use guest blogging to get traffic and customers. I'd love to hear from you if there are any questions you have about guest blogging.